The skulls of alligators protect their brains, eyes and sense organs while producing some of the most powerful bite forces in the animal kingdom. The ability to bite hard is critical for crocodilians to eat their food such as turtles, wildebeest and other large prey; therefore, their anatomy is closely studied by veterinarians and paleontologists who are interested in animal movements and anatomy. 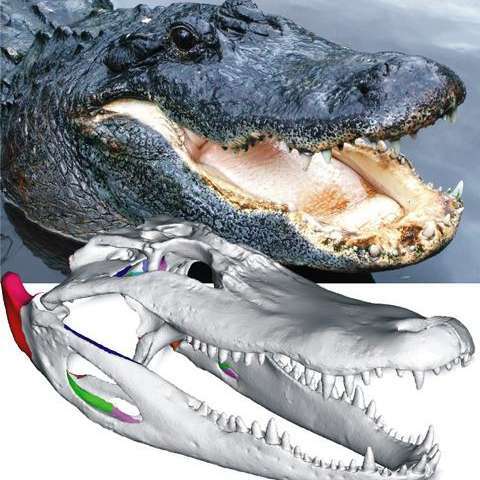 Now, researchers at the University of Missouri and the University of Southern Indiana have developed three-dimensional models of the skull of the American alligator using cutting-edge imaging and computational tools. The researchers validated their simulations using previously reported bite-force data proving their accuracy. These models also can assist scientists in studying the origins and movements of extinct species and other animals.